As noted by myself (author) numerous times, Siacoin is probably one of, if not the most manipulated cryptocurrency out of them all in the cryptosphere. However, that does not mean that it does not represent some lucrative buying opportunities. In this piece we’re going to attempt to dissect whether now is one of those buying opportunities. So, let’s dissect the picture above for a second. The price of Siacoin is currently trading at a resistance. The next overhead resistance for Siacoin is at roughly 125 sats, which is where that P/L box of 8.74% was drawn to. There appears to have been a substantial increase in the price in the last few days/weeks. Since September 17th, 2018, the price has increased by 48.15%, pretty substantial. We can also see that a strong uptrend has developed as well. 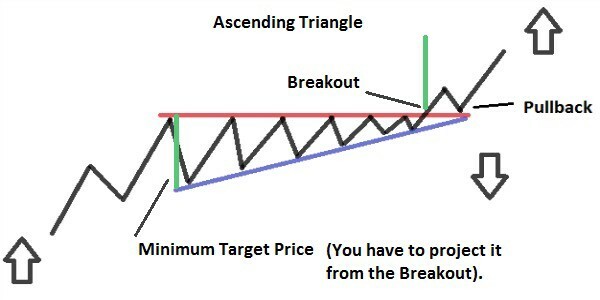 The general characteristics of a flat-top triangle pattern (or ascending triangle formation) are pretty easy to understand from just looking at the graphics. Generally there is a resistance point that the price has continually failed to surpass whilst also posting a series of ‘higher lows’. 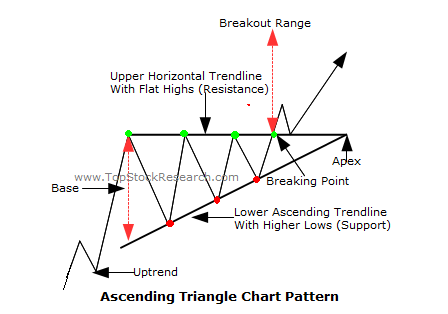 This is a bullish chart pattern formation, and in crypto, this pattern usually plays out to a certain extent. If and when the pattern does play out, make sure that you always watch for the re-test. However, before getting ahead of ourselves, it is important to see if there is an indication that the trend will continue on both the smaller time frames as well as the daily. This will help us to confirm that the price may more than likely break out in due time. As one can see in the picture above, the RSI(14) has posted a very good performance on the H4 chart recently. However, it is also closing in on the overbought region, which means that a potential drawdown before proceeding upward could be a possibility. We’ll need more information before we can make such a conclusion though. So, the next logical step will be to look at the 2-hour chart in order to see if that’s overbought. If that chart is reading that it is grossly overbought, then there’s a solid chance that there could be a drawdown in the price before it eventually rises again. Whether or not it will rise again is contingent on what we can see on the daily chart. Yup, so as expected, the RSI(14) on the 2-hour chart is grossly overbought at this point in time, and the RSI(14) on the 4-hour is getting to that point as well. So, an entry right now in the short-term may not be the best option for traders. As expected, the performance of the RSI is doing pretty well at the moment. It is racing toward the overbought zone, but it is definitely not there as of yet, so there is no danger on the daily in terms of investing that we can detect specifically from the daily RSI(14). We also have a ‘buy signal’ (the line is green; this is a custom RSI indicator), which tells us that buy signal initiated by the RSI(14) has been mostly confirmed at this point. The flat-top triangle formation is still looking solid on the daily resolution as well. The beauty of this indicator is that it detects whether there is buying or selling occurring in the markets. If the line is trending upward, that means that there is accumulation. If the line is trending downward, that means that there’s distribution. There is an RSI-like overlay on the chart as well, which gives us a sense of when the buy/sell pressure is beyond its normal limits. The line turns red when it has detected an extreme in either accumulation or distribution. This indicator is useful because it renders a lot of divergence and it shows when individual on the protocol are either buying or selling. 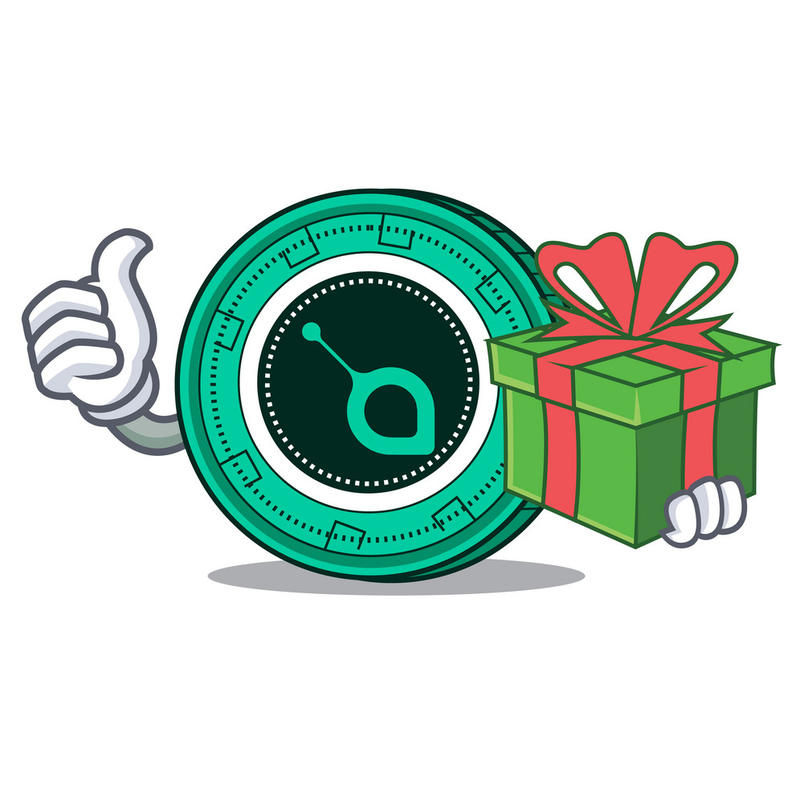 Let’s check out the readings that we get here for Siacoin on the daily resolution. So, in specific, what we can see on the chart is that there has been a large uptick in purchases of Siacoin since October 12th. The first to the last candle in the golden rectangle above represent October 12th-18th. As we can see above, the price was trading sideways during this time period, but there was also substantial accumulation of Siacoin going on during that same period. Thus, the inherent value of this indicator has come to light once again. As noted above when reviewing the Balance of Power RSI for Siacoin, it appears that the accumulation / buy pressure is still rising at a consistent rate, which gives the impression that the overhead resistance probably won’t be enough to send Siacoin’s price back down toward the ground. In this section of the price analysis, we’re going to examine whether there’s anything going on with the Siacoin protocol that would give individuals a logical reason to be bullish on it or whether this is just pure speculation. This is important because, fundamental changes in the protocol or the advent of groundbreaking news can have a long-lasting effect on the price action for that coin; it serves as something that must be taken consideration whenever doing a price analysis (at least if you’re trying to be thorough about it). The first source that we will consult will be CryptoPanic, a news aggregator. They have archived news stories, so we’ll be able to see if any noteworthy events have occurred. We won’t get into litigating the importance of this hard fork on the protocol, but needless to say, the perception of gaining ‘free coins’ from a hard fork is often the driving force behind irrational buying leading up to a hard fork of any sort. There will also be an algorithm change that is involved with this fork as well. So, it’s worth noting that the core, fundamental precept of Siacoin (on a technical level) is changing to some extent with this new hard fork that’s due on Halloween (10/31/2018; American holiday), in approximately eight (8) days. Only panels 5 & 6 are of the utmost importance for what we’re trying to ascertain here. 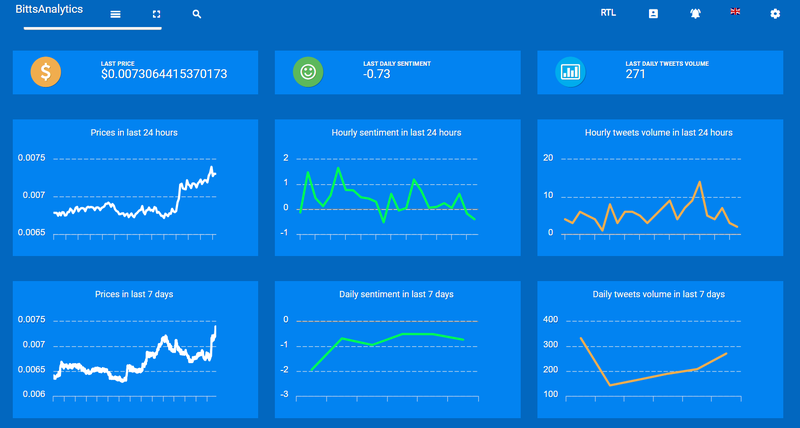 Here, we can see an uptick in the daily sentiment is well as a sharp uptick in the amount of daily tweets about Siacoin, following a sharp dip approximately 7 days ago. 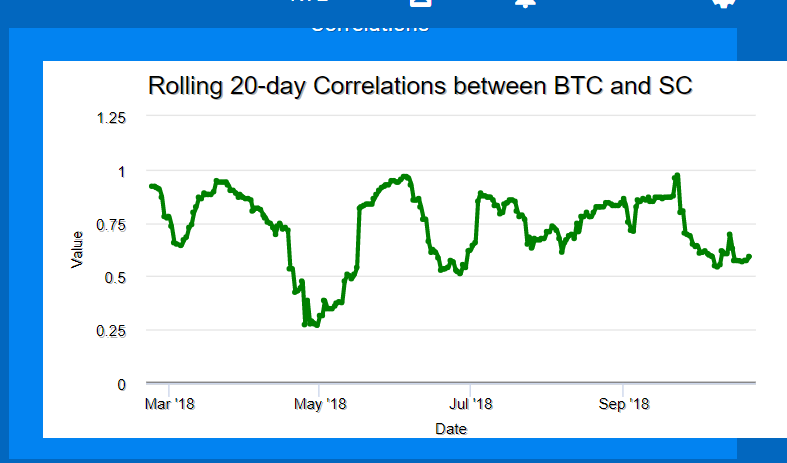 The correlation between $BTC and $SC going down is a positive trend because, as stated above, the price of Bitcoin has remained relatively stagnant in the last month or so. Therefore, a decoupling from Bitcoin’s price in conjunction with an increase in the price signals that it truly is on its way upward. Waiting is generally advised, but operate to your heart’s content. Disclaimer: Please note that this is not trading advice of any sort.